In the previous parts, the build was often incremental - we calculated the difference between current environment and current codebase and modified our environment to correspond to the codebase. With containers, each build is a full build. The result of a build is an image that could be run anywhere with to dependencies. After our image is built and passed the tests it is uploaded into the registry - specialized server to host docker images. There it can replace the previous image with the same tag. For example, due to new commit to the master branch we built the new image (project/version:master) and if tests passed we can replace the image in the registry with the new one under the same tag, so everyone who pulls project/version:master would get a new version. Finally, our images are deployed. CI solution such as GitLab can control that or a specialized orchestrator, but the point is the same - some images are executed, periodically checked for health and updated if a new image version becomes available. 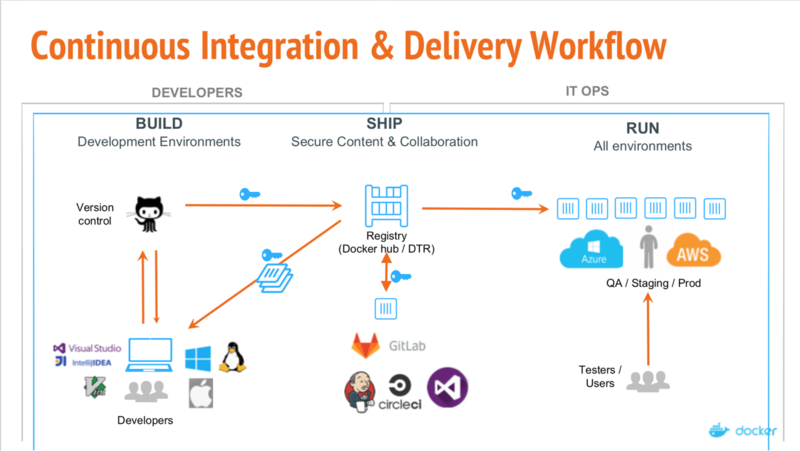 Check out docker webinar explaining these different stages. First of all, we need to run docker somewhere. I'd recommend starting with one server with more mainstream Linux flavor like Ubuntu, RHEL or Suse. Don't use cloud-oriented distributions like CoreOS, RancherOS etc. - they are not really aimed at the beginners. Don't forget to switch storage driver to devicemapper. If we're talking about big deployments then using container orchestration tools like Kubernetes, Rancher or Swarm can automate most tasks but we're not going to discuss them (at least in this part). That's a first container we need to run, and it is a stateless, scalable server-side application that stores and lets you distribute Docker images. Note: GitLab includes in-built registry. You can run it instead of external registry. Read GitLab docs linked in this paragraph. And after reconfiguring GitLab I could see a new Registry tab where we're provided with the information on how to properly tag newly built images, so they would appear here. To do that we need a domain name and add a wildcard DNS record that points *.docker.domain.com to the IP address of docker.domain.com. Other option would be to use different ports. As we have several feature branches we need to redirect subdomains automatically to the correct container. To do that we can use Nginx as a reverse proxy. Here's a guide. Same as before to execute scripts on other servers we'll need to install GitLab runner. I discussed that in the third article. Note that you'll need to use Shell executor and not Docker executor. Docker executor is used when you need something from inside of the image, for example you're building an Android application in java container and you only need an apk. In our case we need a whole container and for that we need Shell executor. It's easy to start running containers and there are many tools to choose from. Dependencies are satisfied at build time and after image is built you don't need to think about dependencies. Reproducibility - you can easily reproduce any existing environment by running the same container locally. Speed - as containers do not have anything except what you explicitly added, they can be built faster more importantly they are built once and used whenever required. Efficiency - same as above containers produce less overhead than, for example, VMs. Scalability - with orchestration tools you can automatically scale your application to the workload and consume only resources you need right now. In the next article, we'll talk create a CD configuration that leverages InterSystems IRIS Docker container.